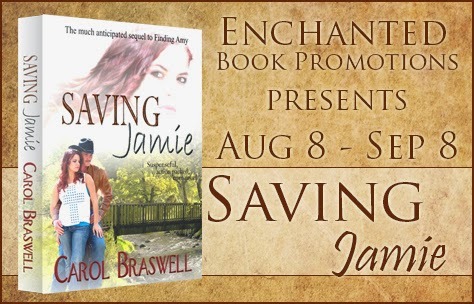 Carol Braswell has been writing since 1994. She took it seriously three years ago when a newspaper story caught her eye and Finding Amy was born. But Amy had an identical twin and her story had to be told as well. 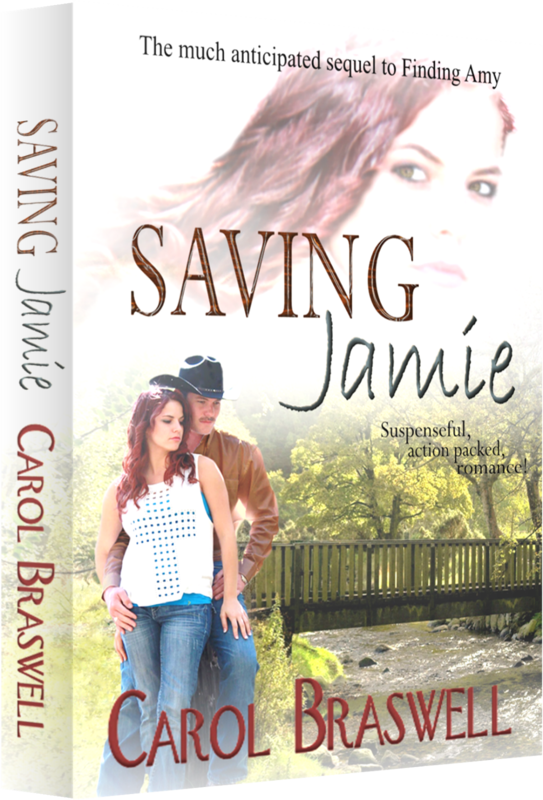 Saving Jamie dictated her story, Carol listened and Jamie’s adventure came to life. Mrs. Braswell says she writes what she loves to read. That is a lot of suspense and a little romance thrown in to keep the emotions flowing. Her page turners keep you on the edge wondering just what will happen next. And you never have to wait long for a hunt and capture or a steamy roll in the sheets. Her books are loaded with both. She lives in east Texas with her hero husband who can fix anything and three very spoiled Maltese. She says her home was built for comfort and tranquility. Hubby built her a pergola where she escapes to writes. Carlos watched his number one assassin walk away arm and arm with the youngest Garrett. AJ would be in the middle of a hornet’s nest and she could get the information he needed to retrieve his money. He picked up his glass of scotch and water and finished the last sip in one gulp. His plane didn’t leave for another hour so there was no need for him to rush. It was a waiting game, now. AJ had done several jobs for him in the past and was reliable; he had no doubt he would get what he wanted. Her marksmanship would stand up to any other shooter in the world. She could engage the mark; either in a personal relationship or a business one. The only problem with AJ was she didn’t come cheap. This job cost him a million dollars, half payable in advance, but it would be well worth the money in the long run. His gut tightened at the thought of how much money Martin Kenner pilfered from the drug money he laundered for the cartel over the past eight years. Martin’s ex stole three million of that money last year. Now, all that was left in the house belonged to the U.S. government, thanks to that idiot Martin sent to find his ex and retrieve the money Jamie stole. The man bungled the job and shot a state trooper in the process. He didn’t get the death penalty because the trooper lived but he wouldn’t be getting out in the next one hundred or so years. Carlos had to pay the head of the cartel back what was lost in the raid at Martin’s house plus the extra million he had promised Marco for the extra time. Now his family was in danger. He couldn’t afford failure. But Martin Kenner would pay for his screw up, too. And Carlos knew exactly how to do it. He retrieved his cell phone and dialed the number he knew by heart.